Private Fleet Car Review: Car Review: 2016 Toyota Corolla Ascent/SX/ZR hatchbacks. 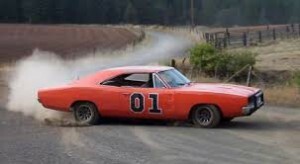 It’s the world’s best selling car with over 41 million sold since being released close to half a century ago and has been seen in three, four and five door versions. 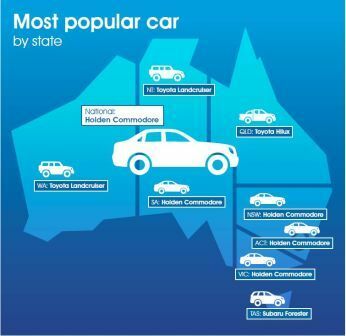 Australia was the first market outside of Japan to receive the Corolla and Australia was the first country to build it outside of Japan. A Wheel Thing had the rare privilege of being able to review three versions of the hatch, back to back, with the Ascent manual hatch, the SX hatch and rangetopping ZR hatch with both fitted with a seven ratio CVT. Sitting comfortably amongst its competitors, such as the Hyundai i30, Kia Cerato, Honda Civic, Mazda 3 and Ford Focus, the Corolla sports a 1.8L alloy blocked four cylinder. Peak power is 103 kW at 6000 revs, torque a decent 173 Nm at 4000 rpm, with a handy amount of that being felt once the tacho swings past 3000. Toyota claims the hatch will sip from the 50L tank at a rate of 6.7L (manual) to 6.1L (auto) per 100 klicks on the combined cycles. The ZR hatch finished on 7.3L/100km and that was virtually all freeway. The manual transmission is a delight; sweet shifting, an almost perfectly balanced take up point for the clutch but a perhaps too light feel for the travel itself. This, of course, depends on the strength of the leg pushing the pedal and with far too many cars in Australia being of self shifting means, it’s not likely to trouble a buyer. Speaking of self shifting, the SX and ZR came with a constant variable transmission, programmed with seven shift points for those that like a manual auto. There’s a well weighted shift mechanism for the auto’s gear selector, it’s not flimsy in feel to move it, plus there’s the paddle shifts on the column. In order to extract the most from the engine with the auto, it does need to be taken up to around 4000 rpm, with that noticeable change in attitude at about 3000, but it’s better done with gradual to moderate acceleration, as a heavy right foot has the engine “slipping the clutch”, with the CVT feeling as if the power isn’t fully utilised. The changes are reasonably sharp, using the paddles, but forward motion is much more noticeable, with response from the engine at a higher plane than using the right foot alone. The manual has a completely different character, the tacho zipping around nicely and with no feeling of losing power to the transmission when pressed, unlike the CVT. There’s different levels of ride quality, not unexpectedly, with the Ascent the most plush of the three. Compared to the tight SX and the taut ZR,the Ascent simple sponged over bumps, exhibited a small measure of body roll when pushed, a touch of tyre understeer and did pass through a bit more road noise as well. The SX was defineably tighter and the ZR, although not as much of a gap between Ascent and SX, was noticeable in being tighter again. Turn in was more precise in the SX and ZR, understeer negligible and felt more stable on the roads. Undulations on the freeways were followed as if the cars were part of the surface, with the body of each following each dip, ripple,curve as if it were glued evenly across the surface, with the suspension dialing out rebound or pogoing swiftly. Both the SX and ZR left the driver feeling confident and safe thanks to the tied down chassis, plus the ZR’s damper rates were just that bit quicker than the SX, imbuing an even higher level of feedback. Having lower profile tyres on slightly bigger wheels helped as well, with the Ascent rolling on 205/55/16s, the SX with Michelins 215/45s on 17s and the ZR the same. Outwardly, the three look similar, with sports styling on the bumpers. The ZR ups the ante, with LED running lights and self levelling headlights for the ZR, plus a massive glass roof, known as Skyview, for the ZR. The current design philosophy of the Corolla hatch is of a slinky, laid back profile, edgy tail light design that wraps around into the rear flanks of the hatch. The head lights have a similar look, with LED running and headlights for the ZR, as mentioned. The front bar of the ZR and SX are of a more sporting bent than the Ascent, understandably, with an almost Formula 1 appearance, with wings wrapping around the bottom corner globe lit driving lights. The rear of the SX and ZR refelct that same design styling. There’s the same basic dash design, with a small binnacle arch for the driver, tying the look back to the seventies but with a catch. The airvents are the throwback, the future comes in the form of a 6.1 inch (Ascent) or 7 inch (Ascent Sport/SX/ZR) touchscreen with deliciously blue backlit tabs on either side. The Ascent has a basic info centre screen laid into the speedo, with tacho and fuel gauge either side, whilst both SX and ZR get the higher res and more info screen in a central position between blue backlit dials, as seen in Camry and Aurion. The ZR gets satnav, as did the SX, with the SX reading out, audibly, speed camera zones and road entry/exits to certain suburbs. The ZR didn’t, but that would be a setting that hadn’t been enabled within the menu system. The system provides an option to connect a smartphone, accessing apps built in via ToyotaLink, plus all cars get Bluetooth connectivity, USB and Auxiliary inputs. Safety wise, a reverse camera image is shown on the screen and a nice surprise, with the steering column across the range being adjustable for tilt and reach. There’s keyless start for the ZR, extra buttons on the tiller for SX/ZR to access the centre screen info, Sports mode button in the centre console in the upper two models, alongside the traction control seen in all three. Cruise is also standard. At the rear, the Ascent and Ascent Sport get full sized spares (the sedan gets a 470 litre boot), SX and ZR cop the lightweight spacesavers. Toyota being Toyota, there’s safety by the hatful, with seven airbags including curtian, Hill Start Assist plus emergency braking lights for following vehicles should your car need to suddenly stop. VSC, Vehicle Stability Control, is standard, as is Traction Control. Warranty wise, Toyota is somewhat behind the Koreans,with “just” a three year,100,00 kilometre warranty. Compared to the five and seven years offered by Hyundai and Kia….There is capped price servicing, Toyota’s own Comprehensive Vehicle Insurance and Extra Care Roadside Assistance to sweeten the pot, however. Corolla isn’t the world’s best selling car for nothing. Toyota have made sure that the little battler doesn’t just appeal to your wallet, it goes for your soul as well. There’s always a measure of charm but A Wheel Thing feels it’s time that Toyota did to the Corolla what it has done with the bigger siblings: leave the past behind and give the interior a more modern feel overall. 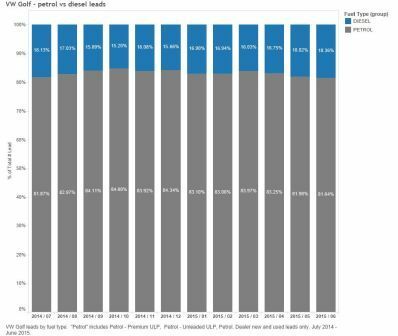 Hyundai’s i30 has been outselling or been so close behind in sales numbers to the Corolla of recent times, Mazda’s 3, Ford’s Focus and even the forthcoming Holden (Opel) Astra have gone “clean sheet” for the dash, the part of the car a driver sees more of than any other. With the top of the ladder ZR omitting simple but expected items, surprising omissions given its intended market, some will look at the opposition and look at what’s included. With the three cars tested, there’s something to like in each. The Ascent delighted with the manual, the SX sat nicely in the middle of the model road and the ZR offered a great view upwards. On the flipside, the Ascent’s somewhat softish ride, SX’s interior trim and ZR’s lack of extra niceties as a top range model lose a few brownie points. Plus, the mix of throwback seventies and today’s tech is a jarring combination. However, Toyota’s core Corolla buyers are generally those that aren’t a fan of massive change yet appreciate the newer things in a car. The recent exterior updates are mild, enough of a refresh to keep Corolla fresh, but not too wild as to alienate those that haven’t bought a new Corolla for five years. With manual adjustment only for the seats in all but the ZR sedan, Toyota have cannily guided those that may have considered Camry but didn’t need a physically big car into the Corolla funnel, with the “old school” touch of being able to “do it for myself”. I’m writing this on 20th October 2015, which means that tomorrow is Back To The Future day. For those of you who managed to miss out on watching Back To The Future II and don’t quite get what’s the big deal about tomorrow, the date 21st October 2015 is the date to which the time-travelling De Lorean hops forward to. In honour of the occasion, it’s time to take a little look at the car that this movie series pushed into the limelight: the DeLorean. To be more specific, the DeLorean DMC-12. The Back To The Future movie series is about the only place you’re really likely to see the DeLorean DMC-12. The company wasn’t a success, in spite of the sort of “product placement” that many manufacturers would pay vast amounts of money for. It didn’t flop simply because it was a small and obscure company – similar product placement of an obscure brand in a sci-fi movie during the mid-1980s worked for Reece’s Pieces in the E.T. movie. 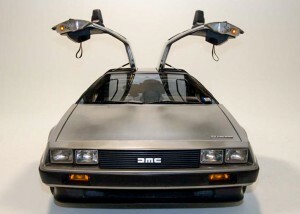 It flopped for a number of reasons, including a massive slump in the US car market, the fact that the main DeLorean factory was located in Belfast, Northern Ireland smack-dab in the middle of the notorious Troubles and the arrest of the company’s head, John DeLorean, for drug trafficking. It’s a pity that the DeLorean didn’t get more widespread, because this two-door sports coupé had a lot going for it, really. 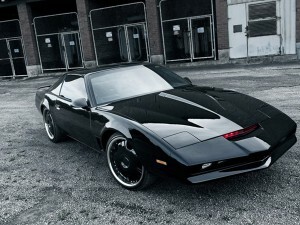 The body styling was innovative and futuristic (which was why it was chosen for the starring role in the movie). It featured a fair amount of fibreglass, a very streamlined rocket-like shape and those über-cool gullwing doors, which also graced the Mercedes-Benz 300SL. Another innovative styling feature of the DeLorean DMC-12 was the decision to leave the metal unpainted but to let the brushed stainless steel speak for itself. Rumour has it that a small, select group of DeLoreans were plated with gold. I hope that last one is a rumour, as it sounds extremely tacky and gag-worthily ostentatious. The engine – which was mounted in the rear like an old-fashioned VW Beetle – was a 2.9-L V6 PRV job, with PRV standing for Peugeot , Renault and Volvo. The initial plan was to have a centrally mounted Wankel engine, but this sounds like a mechanic’s nightmare, so it’s just as well that this idea never made it past the drawing board or the DMC (DeLorean Motor Company) might have flopped a whole lot sooner. The transmission came in two types: a five-speed manual or a three-speed automatic. It could do the 0–60 mph sprint (American equivalent of the 0–100 km/h time) in 8.8 seconds for the manual and 10.5 seconds for the automatic version. The suspension was a four-wheel independent job (double wishbones at the front, multi-link in the rear) that worked alongside coil springs, and telescopic shock absorbers. Power-assisted disk brakes completed the performance and handling package. The DeLorean came reasonably well equipped with bells and whistles for a mid-1980s vehicle, featuring a cassette player, a clock built into the gearshift knob, leather seats, air conditioning, electric windows and power (central) locking. Most DeLoreans were left-hand drive jobs but a few right-hand drives were produced for the UK and Australian market. They never took off. There were a few teething problems with the radio antenna, which had rotten reception with its first location on the front roof, and with the battery, which went flat horribly easily. The DMC company folded in 1983 after having made about 8000–9000 units since production began in 1981, including the right-hand drive models. A few years ago (in 2013), there were a few rumours out there that the DeLorean was going to make a comeback as an electric vehicle with the iconic body style, including the brushed stainless steel with no paint and the gull-wing doors. Although a prototype has been put around a test track and there was a bit of a buzz about it, this project also seems to have fizzled. Or do I speak too soon? A news report from Belfast, Northern Ireland, yesterday hints that an all-electric high-tech version made by the engineering department of Queen’s University Belfast is going to be unveiled tomorrow for Back To The Future Day (OK, make a few adjustments for time-zone differences!). Today, DeLoreans are mostly found in the United States in the hands of enthusiasts. You are unlikely to see one on Australian roads. If, however, you have been lucky enough to spot a real one, tell the world! There’s something about cars – at least cars that have been well designed by human beings rather than computers and algorithms – that makes them into a sort of mechanical animal. Given that we spend as much time with our cars as we do with our pets, it’s no surprise, therefore, that we give silly nicknames to our cars. Some of us go to the point of getting a personalised plate with the name on. Oddly enough, even if you decide to give your car a nickname, it might not stick. Over the years, I have attempted to christen several of the vehicles owned by the family but only a handful of them have stuck. These have been Goldbug (Morris 1300), Suzy (Isuzu Bighorn), Roger The Blute (blue Nissan Navara ute) and Dinky-Wee (Daihatsu Charade). Why these nicknames stuck while others didn’t is uncertain. My attempts, for example, to christen the Saab I used to own and the Volvo I currently drive The Valkyrie and Hilda respectively, never quite came off. However, somebody else referred to that Saab as The Eurobeast and that name stuck. Sometimes, I wonder if the car itself has a say in its naming. How cars acquire nicknames is another story. Colour, make and the letters on the licence plate all seem to play their part. My grandmother, for instance, used the letters on the licence plate to christen her Alfa Romeo Lorenzo (plate had LZ in it) and the red Fiat Uno Orlando (plate with OR) (Italian names for Italian cars – my grandmother was nuts about all things Italian). 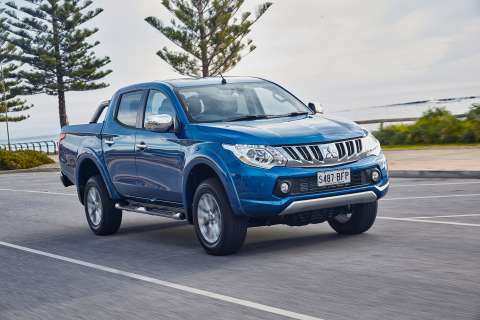 Sometimes two factors get used: our Roger The Blute takes its name from the licence plate letters (RJ) and the colour (blue), with “blute” being a portmanteau word combining “blue” and “ute”. Research seems to support this hunch. One survey in the UK found that 30% of people who gave their cars nicknames used the licence plate, while 27% used the car’s “personality”, 16% used the make or model name as a starting point, 8% used the colour and another 8% just chose something they liked. 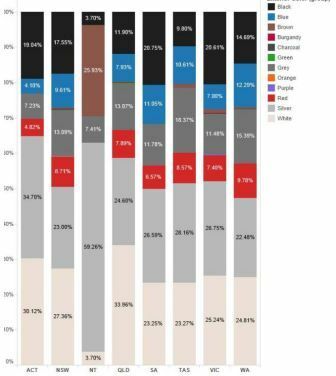 The same study found that 50% of female drivers and 33% of men gave their cars names, and that those aged 18–24 were most likely to name their cars: 70% of this age group in the study had done so, compared to 30% of those over 65. Other people have turned to movies or TV shows to find the right moniker for their car. 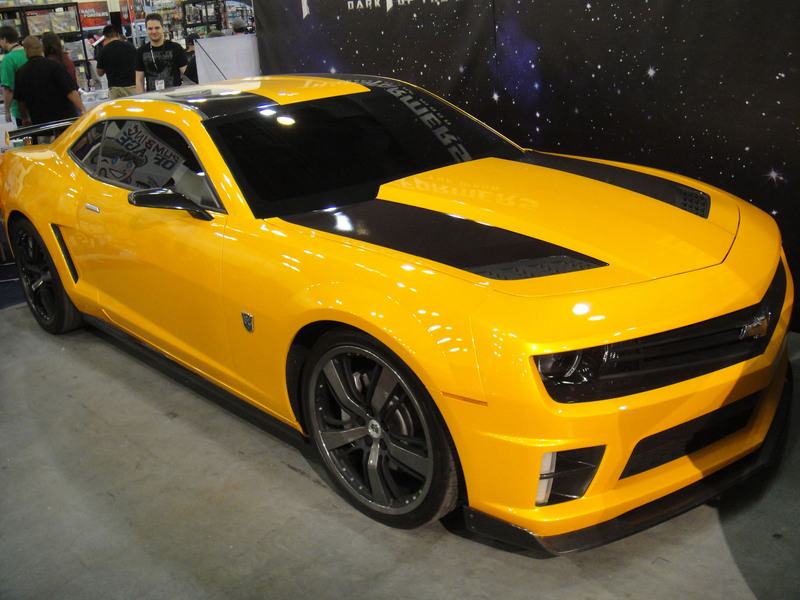 Herbie, Bumblebee, Kitt, General Lee, and Lightning McQueen are all fairly high in the popularity stakes for VW Beetles, Ford Camaros, anything sleek and black, Dodges and anything sleek and red respectively. Batmobile is also a contender for slick black vehicles. We’d have to include Daisy or Miss Daisy here, which is either a reference to Daisy Duke or to Driving Miss Daisy. What about you? Do you have a nickname for your car? What is it? How or why did you choose it? Let us know in the Comments below! The small car market is populated with some pretty good cars and therefore is hotly contested in that segment. Kia’s entry, the Rio, has been an entrant since 2000 in the small car class and has undergone a few body style changes. 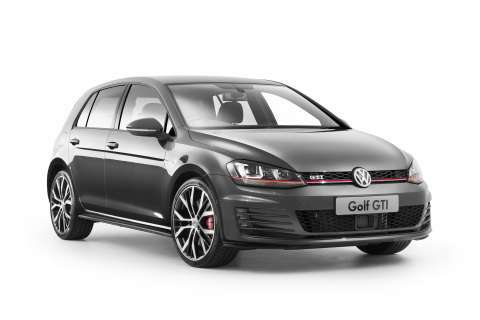 In its current guise, it’s a three or five door hatch with a 1.4L engine (1.6L in the Sport) and archaic four speed auto (in the test car provided, there is a six speed manual as standard for the 1.4L and an auto only for the 1.6L). A Wheel Thing spent a week with the 1.4L, four speed auto, S Premium and came away more than a little surprised. It’s a compact, almost boxy body, with the current iteration sitting on a 2570 mm wheelbase and is just 4045 mm in length. Toss in a 1220 kilo weight with driver and Kia’s claims of 5.7L (manual) and 6.3L (auto) of unleaded from a 43 litre tank seem feasible, with A Wheel Thing finishing on 6.9L, not far off (8.2L/100km highway, 5.2L/100 km highway). The 1.4L engine pumps out just 79 kW at 6300 revs and a seemingly undertorqued figure of 135 Nm (4200 revs). That light weight makes the difference but a four speed auto simply dulls it down to a lacklustre feel. Acceleration, overtaking, aren’t measured in seconds but by calendars. It’s not an unattractive car, especially in the Deep Blue paint ($520 option…); there’s the signature Kia “tiger” grille, somewhat goggle eyed headlights, plastic inserts at the front bumper extremities (driving lights get fitted in the Sports model) and, in profile, the nose rises gently to meet the A pillars in an almost constant line, with a couple of subtle crease lines joining front and rear. The roofline rolls off nicely to a vertical and pert backside. Considering the overall size of the Rio, it’s a pleasant surprise to find a very usable 288L of cargo space available with the 60/40 split fold rear seats up, which increases to 923L when they’re laid flat. Wheelwise, the Rio S Premium sits on 15 inch alloy wheels and they’re clad in 185/65 rubber. Forward motion is hauled in by 256 mm vented front discs and 263 mm solid rears, with surprisingly competent brake feel. The interior in the S Premium (model tested, there’s an S below and Si/SLi above) is spacious enough however lacks an amount of pop and sizzle. It’s a standard steering wheel nowadays with audio controls but does include Bluetooth and cruise, seats are manually adjusted and there’s more a sitting on than in sensation. The centre console is bare and the radio screen is old school, with red dot matrix lighting, sitting above some delightfully simple aircon dials and aircraft styleflick switches. The dash dials housed in the binnacle are as basic as they come, with two large ones for speed and revs with fuel and temperature housed in two separate, small sections to the right of the speedo, which houses a similarly red matrix display. No auto headlights is also a no-no nowadays and only the driver’s window is auto up and down. There’s some class, with piano black surrounds for the audio and ventilation controls, some alloy look highlights for the gear selector and steering wheel and tasteful shades of charcoal and off white for the rest of the cabin. Driving the Rio S Premium turned out to be a mix of fun and frustration, erring on the fun side, showing you sometimes don’t need power or speed to enjoy a car. Hamstrung, as it was, by a comparatively underpowered and undertorqued engine, it still managed to raise a smile with sheer grit and tenacity. How? By exhibiting life, character, verve in its handling. It’s not surefooted, it’s not well planted, it’ll rebound a few times in freeway undulations, it’ll kick the rear around and get unsettled easily but it involves the driver in the driving, not isolating you and leaving you six inches away from the tiller. There’s bump steer (and the steering tends towards understeer), needing instant attention, some body roll and a bit of sponginess, yes, but it brings you, the driver, into its world and asks you to be part of it. Absolutely, you need a water bottle, a cut lunch and a calendar if you’re thinking of overtaking but that’s the fun, the involvement because the driver is no longer waiting on the expectation of the car to do what you think it will do. There’s planning, calculation involved and that can only be a good thing. Once the engine is wound up, there’s a bit of a rasp, a sense of rortiness, from the front, as the speedo does its impression of global warming by moving glacially at first then starts to pick up speed. The gearbox is smooth enough under normal driving but the hole between first and second is noticeable as the revs fall right off and you have to start again. It might be a small car, but it doesn’t scrimp on safety, with a full array of airbags across the range, hill start assist is also standard but only the SLi gets rear parking sensors. There is ISOFIX child seat mounting points and pretensioning seatbelts as standard in all models. The car provided was listed as $19690 plus $520 for the metallic paint, totalling $20210, with the S Premium starting from $16990 (manual). Compared to cars it’s not in direct competition with, that’s a fair amount of coin to ask and A Wheel Thing struggles somewhat to reconcile that figure with what is delivered. Not everyone will see the fun factor the Rio has however the economy will be a strong point in its favour. Lacking a more modern looking dash, again, may not faze some, but that’s no excuse to offer something that the 1980’s quickly forgot about. Tesla Powers Up The Hume. 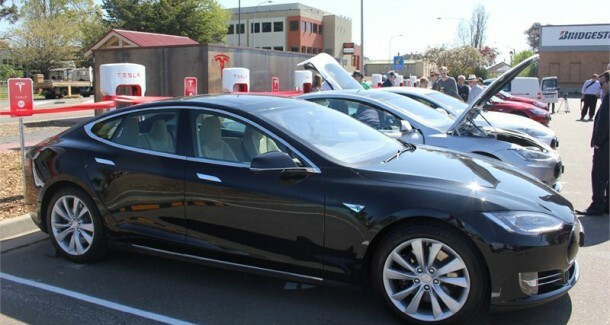 American based electric car maker, Tesla, announced that it has opened two new car supercharging stations for the Hume Highway, which connects Melbourne and Sydney. The stations will allow an owner of a Model S vehicle to potentially achieve 270 kilometres of travel after just thirty minutes of charging time. The Goulbourn station is located at the visitor’s centre in the town itself and is provisioned to charge up to eight cars at once. The Wondonga station, located in the riverside town at 5-13 Havelock Street, will allow up to six cars to be parked for the quick charge system. Both stations have been strategically placed to allow drivers access to town amenities whilst their cars are plugged in and will complement the two charger station at Euroa, north of Melbourne. Power provided is up to 120 kilowatts. 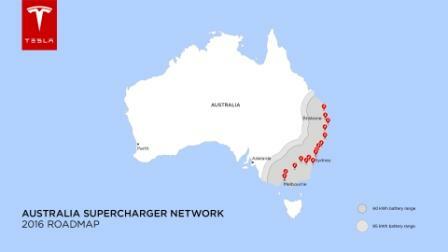 All charging stations are programmed in and can be found by the Google Maps navigation system the Model S cars have. Accessed by the 17 inch touchscreen the vehicles come standard with, it provides peace of mind for a Tesla Model S driver, as the system also shows a clear indication of expected range under driving conditions. The charging system itself can be seen as akin to rapidly filling a glass of water then backing off the flow so as to not overflow, as the charging system computer slows the charge rate as full charge nears. To achieve full charge can take up to eighty minutes as opposed to approximately 80 percent in just that half hour. The two new stations bring the total amount, worldwide, to 501 with close to 2300 individual charging bays. The Goulbourn station at 201 Sloane Street is also the largest in the southern hemisphere. A highlight of the charging stations is that there is no charge (no pun intended) to the driver. For life. 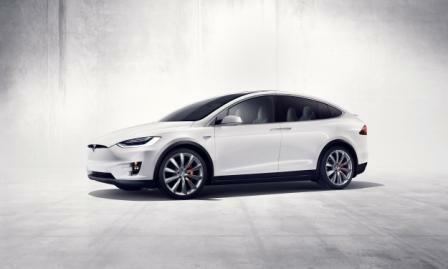 Tesla has also added to its range, with the launch in the U.S. of the Model X. 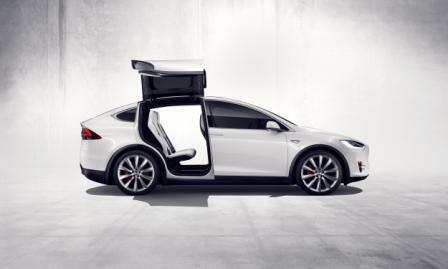 An SUV based design, the Model X is unique in having “double-hinged Falcon Wing” doors, which require a mere 30 centimetres of room either side for passengers to board or step out. For extra safety, each door is fitted with capacitive, inductive and sonar sensors to monitor the surroundings and for extra pizzaz, the driver’s door opens and closes automatically as the driver approaches or exits. 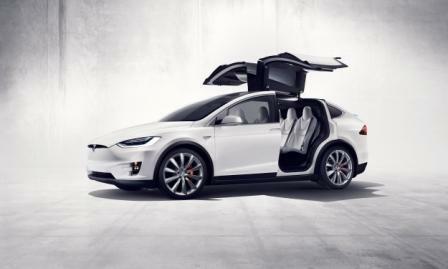 The Model X has been designed and engineered on a clean sheet, to be the safest SUV available. Across the categories measured, it will receive a five star rating, the first SUV to do so. Adding to the safety aspect is the standard fitment of autonomous emergency braking, 360 degree sonar sensors, a forward looking camera plus locates the battery pack, like the Model S, in the floor, giving the Model X an exceptionally low centre of gravity. Steel rails reinforce the aluminuim pillars to provide both extra strength for the passenger safety cell and reduce weight if afull steel cage was used. These add up to give the Model X a zero to 100 kmh time of 3.2 seconds (with the recently announced Ludicrous program engaged), the quickest of any SUV, with a top speed of just over 240 kmh. Aiding these numbers is an exceptionally low drag figure, just 0.24 cD and an all wheel drive system. When it comes to passenger comfort, there’s a full HEPA air filtration system plus monopost seats that slide fore and aft, allowing both flexibility and ease of access to the third row seats. For the driver, Tesla add their Auto Park and Auto Steer systems. Pricing for Australia is yet to be confirmed. Jaguar‘s renaissance has continued with the September 2015 launch of the XE, the smaller sibling to their XF saloon. Powered almost exclusively, for the moment anyway, by a range of four cylinder engines from the diesel and petrol powered (as the S gets the 250kW V6 found in the XF…), there’s a four model range to select from, being the Prestige, S, Portfolio and R-Sport. A Wheel Thing was handed the keys to the Prestige, with a 2.0L petrol turboed four on board. There’s a clear family resemblance, as expected, to the XF, but also design cues from the F-Type family. Toss in a mix of style hints from the XJ, such as the bluff, vertical nose, the lonnnnng bonnet and short tail with F-Type inspired tail lights and it’s clear it’s a Jag. The Prestige, as mentioned, is powered by a two litre petrol engine with a little extra help for the induction side. There’s two levels of oomph, with either 147 kW or 177 kW and 280/340 torques available from a mesa flat 1750 to 4000 revs. Transmission comes in any ratio spread you like as long as it’s an eight speed auto. Economy is (ahem) not bad from the 63L tank, with Jaguar quoting 10.2/6.0/7.5L per 100 kilometres on the urban/highway/combined cycles. A Wheel Thing levelled out at around 7.0L/100 km. Considering the 1530 kg weight (dry, thanks to the aluminuim construction), that’s pretty decent. Plus, Jaguar have engineered in a regenerative charging system that helps to top up the battery under braking and passes the fuel savings on to the engine. The XE is aimed fair and square at Germany; Audi, BMW, Mercedes-Benz, Volkswagen too in the mix. Physically it’s a good size, at 4672 mm long, 1850 mm wide (excluding mirrors) and a compact 1416 mm in height. Check out an A4, 3 series, C Class etc and they’ll all be in there size wise. Riding on a 2835 mm wheelbase you’d be forgiven for presuming there’s a bucketload of room inside. More on that, later. Wheelwise, the XE (coated in a gorgeous “Ultimate Black” and a $1300 option for the Prestige) rolled on 225/45 rubber with black painted “Matrix” alloys of an 18 inch diameter. There’s plenty of option packs available for the XE range, including a Black Pack for the Portfolio, lobbing you a black grille, side window surrounds and more. Does an XE look good in black? Does it ever! At night the tail lights glow with an almost volcanic orange hue, a neon line on either side, balanced by the J curve of the LED running lights at the front. There’s a phosphor blue interior light, plus, with the driving modes on offer, Sport mode lights up the dash dials with a deep red. On the road the XE sets the dynamic cat amongst the benchmark pigeons. Yes, it’s that good. There’s next to no main road surface that will unsettle it, the EPAS (electric powered assisted steering) is knife edge sharp in response and perfectly weighted. Turns are smooth, with next to no hint of understeer when pushed and balanced on the throttle there’s no understeer, thanks to the near 50:50 weight distribution. Body roll is unheard of and when Dynamic mode is selected (via centre console mounted buttons) the “cat” comes more alive. Throttle response is sharper, the steering feels, incredibly, more en pointe, the suspension feels more glued to the car and the road, feeling every ripple and tracking every curve yet screens out the annoying bumps and transmits pure driving joy. The acceleration from the 2.0L turbo petrol is astounding in Dynamic and more than pleasing in Normal. The aluminuim construction helps, with torsional stiffness and rigidity (22 kNm/degree) holding the bodyshell taut as the XE is driven with verve, plus gives the XE the lightest body in its class. The eight speedauto in Eco or Normal mode is smooth, like a fresh made vanilla milkshake. Under acceleration, be it light, moderate or exuberant, there’s forward motion and gear changes blurring imperceptibly. Using the paddle shifts elicits the same response…then there’s the Dynamic mode. Changes aren’t as crisp, sharp, there’s even some indecisiveness at low speeds. In profile, the XE looks as if there’s plenty of room inside. There is, for the front seat passengers but even a driver of average height, having settled and adjusted the electric seats and steering column, leaves the rear seat passengers a touch cramped for leg room. Some smart engineering allows head room, with an indentation in the roof just behind the sunroof’s rolling fabric screen locker, but leg room is an issue. Having the rear seats a couple of inches forward of where logic (and we’re not talking safety or engineering here, mind you) would have you think they’d be, contributes to the feeling of tightness. Luxury wise, the XE Prestige needs some more. There’s hard plastic for the centre console, hard as in there’s NO give whatsoever and a driver’s left knee rests naturally on it and it becomes painful. Even the door trims and dash covering need more softness, as could the steering wheel, it’s just that tad too unpadded. Ergonomically, the cabin is mostly ok, however the two level door trim, with (driver’s side) window switches high up and 3 position memory seating almost where you’d expect the armrest to be, clash with the simple and clearly laid out aircon controls on the lower centre dash, underneath the 6.1 inch touchscreen ( a delight to use in its own right). Noticeable, in its absence, is any hint of woodgrain, but the XE does get the curved upper dash wrap around as first seen in the XJ. The seats are, naturally, wonderful to sit in (but heating and cooling are options…), allowing the driver and passenger to look at a dash where the outer air vents are set too low down for true effectiveness. A laid back angle to help direct air upwards would help or a relocation further upwards. The dials in the driver’s binnacle are easy to read and of a mechanical needle style, however a full or partial LCD screen here would also have been nice. There’s the aforementioned sunroof, with a roll into the roof fabric screen, to start with before the glass is exposed. The sound system is from Meridian, all 380 watts of it, and has the front mounted tweeters cleverly mounted to fire at the driver and passenger, rather than across the cabin as many others do. The touchscreen system makes adjustment of the sound and utilising the nav system a doddle. There is some great tech on board, with Jaguar’s All Surface Progress Control, allowing the traction system to work as a low speed cruise control. Working between 3.6 kmh and 30 kmh, it gives the driver the ability to steer the XE on slippery and wet surfaces, even on a downhill run, stopping or minimising loss of traction. There’s another acronym to learn, EDC or Engine Drag torque Control, which ties in with the ABS by providing more torque to the braking wheels under heavy deceleration on slippery surfaces. Naturally there’s a reverse camera, which can also be selected whilst the Jaguar is under way, the engine Stop/Star system, parking assist (front and rear sensors for rear and nose in parking), Lane Departure Warning, Tyre Pressure Monitoring and a swag more. Storage wise, the boot is a considerable 455L. The Wrap. There’s little doubt the Jaguar brand is thriving, with the launch of the XE and F-Pace, Jaguar’s first SUV, plus a new XF on the way for Australia as well. The big cat, the XJ, also underwent a styling update recently. The XE range is aimed, it would seem, at a “younger” audience, with the somewhat unJaguar like lack of anything resembling wood, the slightly cramped rear passenger section but it’s a market that’s growing. Jaguar also recognises the growth in the SUV segment, with the F-Pace on the way. There’s plenty of tech-spec to play with, such as the (almost) purely turbo charged engine range with four pot configuration, it’s possibly one of the best cars in a dynamic sense in its class and doesn’t look half bad either, an important consideration for some. 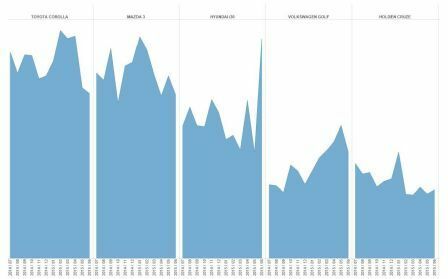 It’s keenly priced to attract that segment of buyers, as well, starting in the low $60K bracket. Should the Germans, the target for the XE’s guns, be worried? Iconic British brand, Jaguar, has long been an innovator in the auto industry. It’s also come perilously close to going under as a maker but thankfully Indian based conglomerate Tata threw them a chequebook and said go for it. As a result we’ve seen the rebirth of the XJ, the fantastic F-Type and its sibling, the F-Pace SUV. The XF series (now into its third styling), has been a favourite within the brand and A Wheel Thing looks at an example of the outgoing model, in the shape of the 3.0L V6 R-Sport. First released in 2008, with a bug eyed look and a svelte coupe profile, the XF quickly made its mark against its traditional German rivals. A facelift in 2011 gave the front a much needed makeover, a minor change to the rear and an eight speed gearbox. The car Jaguar Australia provided to A Wheel Thing, the R-Sport, had that plus a grunty yet silky smooth supercharged V6 with petrol the preferred juice, as Jaguar also has a diesel version. Hiding underneath both a lithe bonnet and acres of plastic is a 250 kW/450 Nm engine, sipping unleaded at a rate of 13.9/7.0/9.6 litres (urban/highway/combined) from a 70L tank. Although tractable, flexible, enjoyable, the thirst was a touch unexpected. But, there’s a caveat and an odd one, to be sure. On a return run to Canberra, the R-Sport used slightly over a half tank of fuel, brimmed before departure to reach its destination. Although it’s an aluminuim build in parts, the XF R-Sport still weighs in excess of 1850 kilos, which contributes towards that fuel consumption. That mass is also noticeable when seriously hustling the R-Sport, along with the fact that peak torque figure doesn’t happen until there’s 3500 revs on board, meaning a bit of a peddle is needed to get the big cat up and running. There’s plenty of grip to play with, though, with chunky and ultra low profile Dunlop (255/35) rubber on black clad 20 inch alloys, which are highlighted by the deep blue on the car. Compared to the first XF, there’s the far more attractive headlight design, the LED tail lights and J-shape LED driving lights, a reworked front bumper design and,for the R-Sport, a small boot lip spoiler. Taken through a road that’s popular with drivers, being a downhill run with off camber turns, sweeping curves into hard brake points and a wonderful tightening radius turn, the R-Sport hunkered down and powered through with the grace, pace and space expected. The brakes themselves are wonderfully progressive, with feel from the first touch and biting more on the downwards travel without any feel of fading or needing more pressure. There’s some handy tech though, such as rain sensing wipers, auto dim headlights (option), blind spot alert (option), the imperceptible shifts in the eight speed auto, Winter and Sport Mode for the drivetrain, Stop/Start for the engine, Pedestrian Contact Sensing System, tyre pressure monitoring (option) and the 380W Meridian sound system,plus the usual suite of airbags and driver aids. There’s little doubt that Jaguar, as a brand, is iconic. A Wheel Thing owns two XJ6’s, a series 2 and a series 3 Sovereign. Being able to test the modern Jaguars is both an honour and a tug of the heartstrings, as Jaguar has survived unlike so many other British brands. The open chequebook from Tata has gone a long way to help Jaguar reposition itself in the automotive marketplace, from the completely redesigned XJ to the F-Type and Jaguar’s first SUV, the F-Pace. 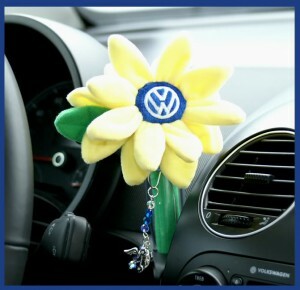 Oh Volkswagen, How Could You??? Why did you do it? Why, oh, why did you fit your common-rail TDI diesel engines with cunning devices that cheated during emissions testing? Did you mothers never tell you that “cheaters never prosper” and that honesty is the best policy? Didn’t you realise that it was just a matter of time before you were busted? Make no mistake about it, Martin. We like your cars. We all know how iconic Beetles and Combis are. 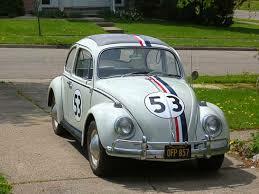 The Beetle is the quintessential car that gives everybody a smile and has real personality. Even if practicality dictates that a Beetle can’t be part of our driving life, we love them anyway. We love the tough Amarok and Touareg, the snazzy Golf and Passat. We like the practicality of the Caddy and the Transporter. The fact that the recall affects five million cars worldwide just goes to show how much we like your vehicles. We also like diesel engines. We like the way that a diesel engine tends to be more forgiving in the hands of a learner driver who’s learning not to stall. We like the way that diesels have better torque for towing and off-roading. We also like the way that diesel can be produced from environmentally friendly and sustainable sources like algae and waste oil to make biodiesel. Surely, if you’ve got designers with the intelligence and skills to come up with an engine that’s smart enough to recognise when it’s being put through lab testing and adjust its emissions readouts, you have the team needed to develop an engine that has lower emissions all the time. Let’s face it: developing that took a lot of skill and sophistication. The same skill and sophistication could easily have been applied elsewhere to make your already good cars even better. So what was the point of cheating? Now you’ve got the bother and expense of recalling all the affected VWs (and Audis and Skodas) with the engines in question. And several have been banned for sale here in Australia, which is really bad news for all of us in the automotive industry. All those lovely Golf hatchbacks, Tiguan SUVs, Passat sedans and wagons, Audi A4 sedans and wagons, Audi A5 coupes, Audi Q5 2.0 TDI SUVs, Skoda Yeti SUVs and Skoda Superb sedans and wagons suspended from sale here Down Under, languishing in car yards instead of being on the roads where they belong. Anything with a fitted with 1.6 or 2.0-litre EA189 diesel engine, in fact. The news informs us that a few of your engineers and suppliers spoke up as early as 2011 (or even 2007) warning you not to misuse the technology. I hope you’ve been nice to them. You should have listened. Now you’re stuck with damage control. You will be able to bounce back from this. Lots of vehicles have bounced back from scandals, from the Ford Pinto fiasco to the Mercedes that rolled over in the Moose Test. Your cars are certainly good enough. We will buy them again… once you’ve made honest vehicles out of them. Possibly, you have done the automotive world a service. You have highlighted the fact that driving in a lab test isn’t the same as driving in the real world. Maybe after this, cars will be put through real world tests in real-world conditions so their fuel economy (and emissions) stats will reflect the real thing. Lab testing is like sucking your tummy in when you get out the tape measure: it might make you feel nice inside at first but will leave you feeling horribly squeezed later. So thanks for highlighting this issue. PS: VW Owners: More information is available at the VW website as it becomes available.